Create great looking reports in LabVIEW today! Using the Custom PDF Generator you can easily create high quality PDF documents directly from your LabVIEW programs. Content can include text, tables, front panel views and images, all with a wide range of formatting options. "A very useful toolkit to create professional looking reports in a very user friendly format. The toolkit provides a lot of functions, and is easy and intuitive to use. The toolkit also includes a lot of helpful examples." This report is generated with one of the examples which ships with the toolkit and shows how a well formatted production test report can be generated. The title is centered and has a custom font and size configured, with underlining enabled. A JPEG image is embedded into the document and configured with centered alignment. The formatting of each cell is set individually. Red and green backgrounds are used to indicate the pass/fail status of results. The headers and footers are customized to our requirements. Special tags set page numbering and date/time. 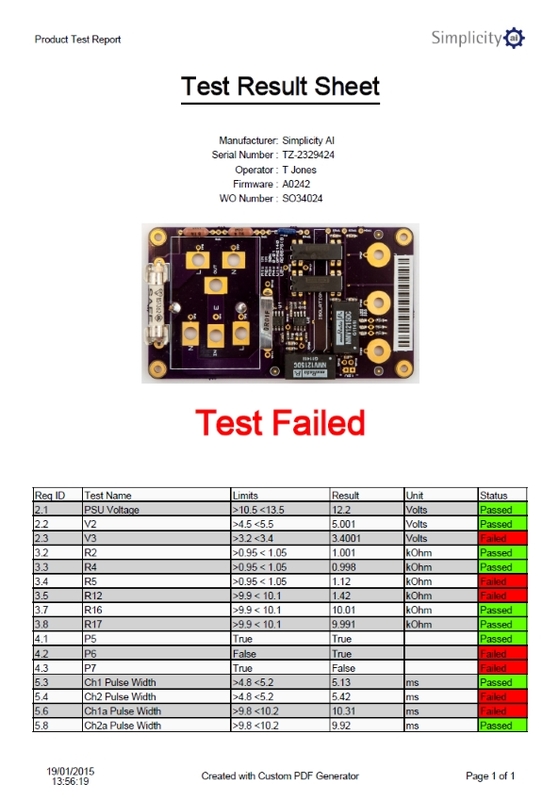 Have a question on the Custom PDF Generator for LabVIEW?